Research Notes of the AAS Are Back and Better Than Ever! 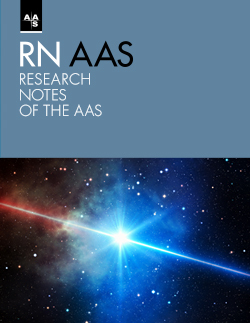 The AAS and its publications partner the Institute of Physics (IOP) Publishing announce the return of Research Notes of the AAS (RNAAS) — short communications for the rapid publication and distribution of new and exciting results. Last published in print in the 1970s, RNAAS have been brought up to date for digital publication by the AAS editorial team, led by AAS Editor in Chief Ethan Vishniac and Oxford University astrophysicist Chris Lintott, who serves as the AAS journals’ Lead Editor for Instrumentation, Software, Laboratory Astrophysics, and Data. As noted in an editorial in the first issue, Research Notes are short communications — at most 1,000 words and one figure or table — that provide an indexed and secure record of works in progress, comments and clarifications, null results, and timely reports of observations, such as the spectrum of a supernova. They will also cover results that wouldn’t traditionally merit a full paper, such as the discovery of a single unremarkable exoplanet, a spectrum of a meteor, or contributions to the monitoring of variable sources. The Society welcomes submissions to Research Notes of the AAS through our usual manuscript submission site.